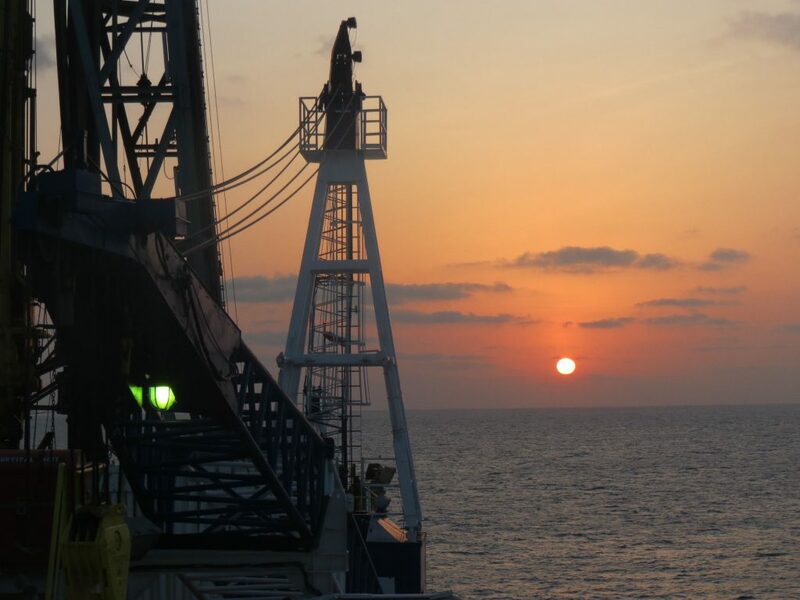 We have now successfully recovered the top 200 m of the sediment at our new site and we are now preparing to drill deeply, hopefully as far as 1000 m below the seafloor into the igneous basement of the Laxmi Basin. Unfortunately to do that we have to change from the piston core equipment to the rotary drilling system which is similar to that used on normal oil rigs. This means retrieving all the drilling pipe out of the hole and back onto the ship, replacing the drilling bit and returning to the seafloor. This is not a quick operation and takes us about 24 hours to complete because there is around 3 1/2 km of pipe between us and the seafloor alone. Consequently we are now trying to catch up with all the material that is yet to be described but this does give us one or two moments to go outside and appreciate attractive scenes like the one you see here. Sunrise over the Arabian Sea.